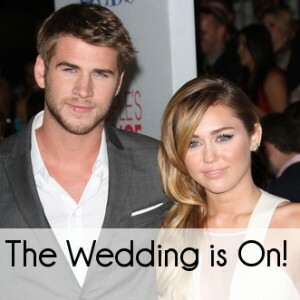 Miley Cyrus Twitter Photos: Engagement to Liam Hemsworth is On! “I’m so happy to be engaged and look forward to a life of happiness with Liam.” It’s unknown whether the two will ever wed, but the turmoil surrounding the situation is continually entertaining. After being photographed for months with no engagement ring on her finger, Cyrus has recently been seen wearing the ring again. According to Us Magazine, Cyrus was wearing the ring on the red carpet at the Maxim Hot 100 Party. Will The Engagement Between Miley Cyrus and Liam Hemsworth Lead to a Wedding? If Hemsworth’s brothers, Luke and Chris, have anything to say about it, the answer will be no! According to The Huffington Post, the brothers set up an intervention style meeting with Hemsworth in April, asking him to end the engagement once and for all. Despite the brothers’ wishes, Cyrus and Hemsworth continue to plan their wedding, for now. With all the negativity surrounding the engagement, it would be hard to imagine the wedding going smoothly, let the marriage. One thing is certain, if Miley Cyrus and Liam Hemsworth plan to go through with this wedding, they need to do some series soul searching, before making the commitment.